The UK Independence Party is doing extremely well in the local and European elections held across England yesterday. It is, to put it mildly, an unpleasant sort of political party. It has more than its fair share of bigots and homophobes. But it is more than simply a tribe of disgruntled nostalgics. It’s also a protest party, and its particular brand of protest has venerable linage that goes back to at least the Evil May Day riots of 1517.
the Genowayes, Frenchemen and other straungers sayde and boasted them selfes to be in suche favoure with the kyng and hys counsaill, that they set naughte by the rulers of the citie: And the multitude of straungers was so great about London, that the pore Englishe artificers coulde ska[r]ce get any living: And most of all the straungers were so proude, that they disdained, mocked and oppressed the Englishemen, whiche was the beginning of the grudge. Locals complained that the ‘strangers’ from overseas flouted the law with impunity, engaging in theft, kidnapping and even murder without facing the punishments that would have been meted out to a common English criminal. The political element becomes even clearer when we examine the rioters’ main targets. The crowds of hundreds, or possibly thousands, who rushed through the streets that night did not burn and loot indiscriminately. Instead, they attacked the house of a French merchant who was also a royal secretary, the homes of alien artisans at a site officially designated for foreigners, and two ambassadors who were supposed to be under the king’s protection. When the rioters were captured, at least 15 were hanged, drawn and quartered for ‘treason’ because their attacks on the strangers had ‘broken the truce and league’ between Henry VIII and the other princes of Europe. So, in the eyes of Tudor Londoners, what made these immigrants so dangerous was the apparent alliance between ‘the multitude of straungers’ and ‘the kyng and hys counsaill’. That is to say, the foreign threat came not from poor or marginalised immigrants but from outsiders who enjoyed special privileges and had the support of the political elites. It would be easy to multiply such examples by looking at other moments of heightened anti-foreigner sentiment in early modern England. One could cite, for example, the opposition to King James I’s favouritism towards his fellow Scots, the francophobic riots of Charles II’s francophile reign, or the anti-Dutch sentiment that bubbled up after William III took the throne in 1689. In each case there were very real resentments about the apparent social and economic impact of immigrant groups, but these were combined with a sense that the current political regime was in league with the foreigners. A forlorn British worker, supposedly abondoned by Europhile political elites, and a big pointy hand. 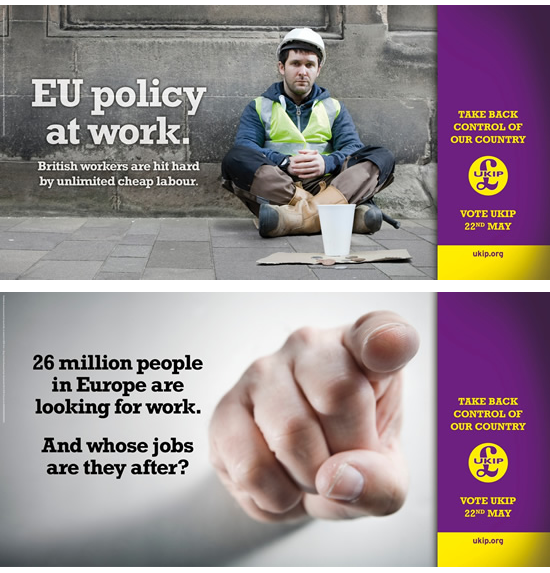 Racism, then, is certainly an important ingredient in UKIP’s noisome ideology but it is not the only one. If we want to understand and counteract the rise of this dangerous party, we need to acknowledge that a vote for UKIP is as much a protest against the failures of Britain’s governing class as it is an anxious reaction against newcomers. The events of 1517 are described several primary sources, all of which are freely available online: the chronicle of Edward Hall (1904 edition, edited by Charles Whibley, pp. 153-64, quote at 153-4), the chronicle of the Grey Friars and the Calendar of State Papers, Venetian. 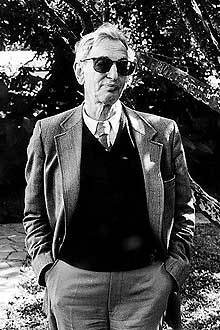 Eric Hobsbawm was not an early modernist. Although he wandered into the seventeenth century every once and awhile, his scholarship was focused on the nineteenth and twentieth centuries. Yet it would be unjust to dismiss him as irrelevant. Not only did he come up with some of the key concepts used by early modernists – such as ‘primitive rebels’, ‘invented traditions’ and even ‘the general crisis of the seventeenth century’ – he also very publically wrestled with the problem of politically informed and socially committed history. Two weeks ago, a truly extraordinary gathering of historians met to explore these issues at the ‘History After Hobsbawm’ conference in London. I don’t exaggerate when I say this was a remarkable group – Sam Wetherell suggested the line-up was ‘like the Glastonbury of modern British history’, which seems about right. The result was a lot of great conversations at the event, online and of course at the pub afterwards. There are a bunch of reports, reviews, podcasts and tweets collected at the conference website. I wanted to draw attention to a few of those pieces written by early modernists that may be of interest to our readers. If you have any comments or questions I’d encourage you to put them here as there are no comments on the conference blog. I’ll pass comments here on to the authors. The ‘spectres of Marx’ that haunted many of the conference conservations were very visible in the commentaries from early modernists. Hillary Taylor discussed how Jane Whittle, Andy Wood and Lucy Robinson dealt with issues such as ‘class’ before the industrial revolution and ‘primitive rebels’ outside of formally organised protests. She suggested that some ‘ecumenical sampling’ of Marxist analysis – by both Marx himself as well as less well-known thinkers like Ferruccio Rossi-Landi and Nicos Poulantzas – can still illuminate key aspects of early modern society. Mark Hailwood agreed and suggested that the label ‘post-Marxist’ might be appropriate as such an approach is neither anti-Marxist nor even strictly non-Marxist, but instead ‘picking up some of the pieces’ left behind after the ‘purgatory of the 1990s’. Indeed, he noted that many so-called Marxists – including Hobsbawm – have been doing this all along. Dave Hitchcock looked specifically at Gareth Stedman Jones’s discussion of the supposed ‘paradox’ of ‘good Marxist history’. Jones seemed to claim that Marx was merely a distraction from the strength of the longer tradition of intellectual critique that preceded him. Dave, in contrast, argued strongly that without Marx and successors like Hobsbawm historians would have a much weaker awareness of the history of social experience and of the brutal realities of material existence. The second major theme to emerge from these discussions was the link between past and present in historical scholarship. This was perhaps most prominent in Lucy Robinson’s talk, summarised by Hillary, as it focused on the ‘history’ of the 2010 Brighton school students protest, in which the ‘historian’ was amongst the crowd! However, it is also very relevant to early modernists. Hillary, Mark and Dave all noted the power of ‘socially committed’ scholars in bringing to light previously neglected topics such as protest and subordination. Moreover, the crushing defeats of organised labour and international communism in the 1980s clearly had an effect on how historians used concepts like ‘class’: the shifting political climate directly influenced academic debates and methodologies. The panellists discussed by Robert Stearn made this very clear in their analysis of the retreat of traditional ‘labour history’ over the last generation. Here, the impact of a changing political situation are plain to see. This final point was driven home for me in the panel I wrote about, in which John Elliot, Geoffrey Parker and Sanjay Subrahmanyham talked about ‘the seventeen-century crisis’. It is not difficult to find some of the momentous events of the twentieth century – namely the Depression, the World Wars, the rise of globalisation and the discovery of climate change – shaping the way scholars conceived of early modern society. It’s often said that we can’t escape the past, but it’s clear that even historians can’t escape the present either. There are also some earlier thoughts on Hobsbawm from me and (in the comments) Mark, Jonathan, Laura and Newton Key, that might be relevant. Open access to the past – no doubt we would like all archives and historical artefacts to be freely available to the public, but that is hardly practicable. In reality open access damages the relics of the past and shortens their life span. Do the Soane’s museum’s limited walkways validate limited access? Limited access to the past – do some people have more right to see collections than others? Do those who help fund preservation, or whose interest goes beyond mere curiosity (the benefactor, the architecture student, the historian) have a better claim? How can that be squared with public funding of heritage or with sites with particular national, international or global importance? Resources – conservation is an expensive business, and rightly is not at the top of a government’s budgetary plans. One way to raise funds is to attract visitors who will spend money in the gift shop, on the guide book, or on a tour. Some collections wouldn’t survive without this income, but attracting large visitor numbers brings further preservation problems. Meaning of preservation – surely the crux of the heritage questions lies here – why do we want to keep this stuff anyway? The past can help us to understand ourselves as a society or nation, but only if people actually encounter it. Perhaps we should limit access to a few chosen experts, whose remit is to tell other people about it? But isn’t that unfair? And who gets to choose who the experts are and polices their outputs? Process of preservation – How do we decide what is worth protecting, especially given that historical tastes shift so dramatically over time? Something that one generation values might be seen as rubbish by the next. During the dissolution of the monasteries, manuscripts that we would consider to be priceless were used to wipe boots and wrap food in, highlighting the tendency for ritual and deliberate destruction of the past for political or propaganda purposes. What universal priorities might there be to identify what is important and to provide rules for preservation? Means of preservation – a recent trend is for historically important buildings to be adapted in order to preserve them. Old meeting houses and chapels that have fallen into disuse are renovated to create characterful homes or blocks of apartments. Abandoned warehouses become nightclubs, archaic power stations art galleries. On my street in Exeter, the old electricity building has become a climbing centre – inside photographs show the interior as it used to be, and original features such as the floor to ceiling tiling can now be seen by anyone that wanders in (you don’t have to pay or climb!). Across the river the splendid seventeenth-century Custom House is now a shop, complete with original plasterwork, wood paneled walls and a sweeping staircase – again, when the shop is open then the public can explore to their heart’s content. 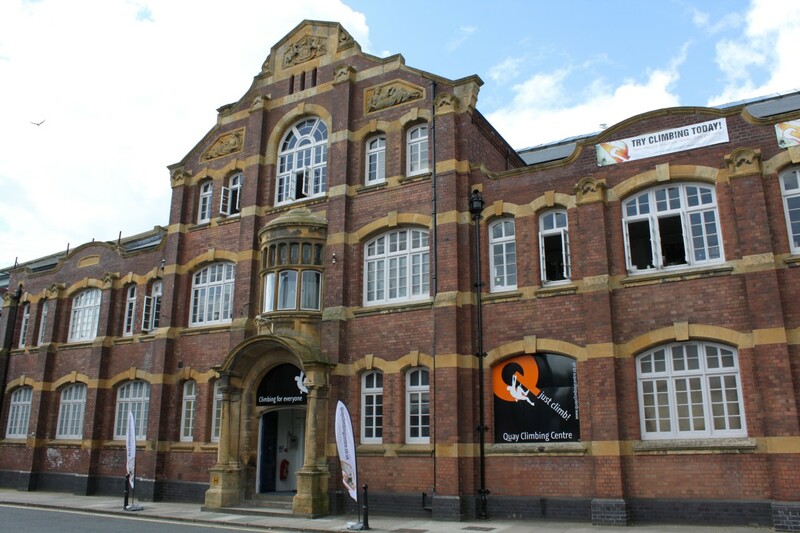 Exeter’s Quay Climbing Centre breaths new life into the Old Electricity Works. Making the past benefit the present – changing the purpose of a building is of course a compromise – it will alter the contours and function of the original, and in the case of a conversion to private dwellings, only preserves the exterior for the benefit of the public. But I have to admit to being rather sympathetic to this. Evidently we do not have the means to secure every historical monument that we would like to, and a change of purpose does give buildings a more secure future, albeit an altered one. But this is not simply pragmatic – I also think that if the social function of a building has become redundant, then it is a virtue to open the space up to a new constituency by making it useful and appealing to them. The ‘Wetherspoons’ pub chain has a strong track record here. 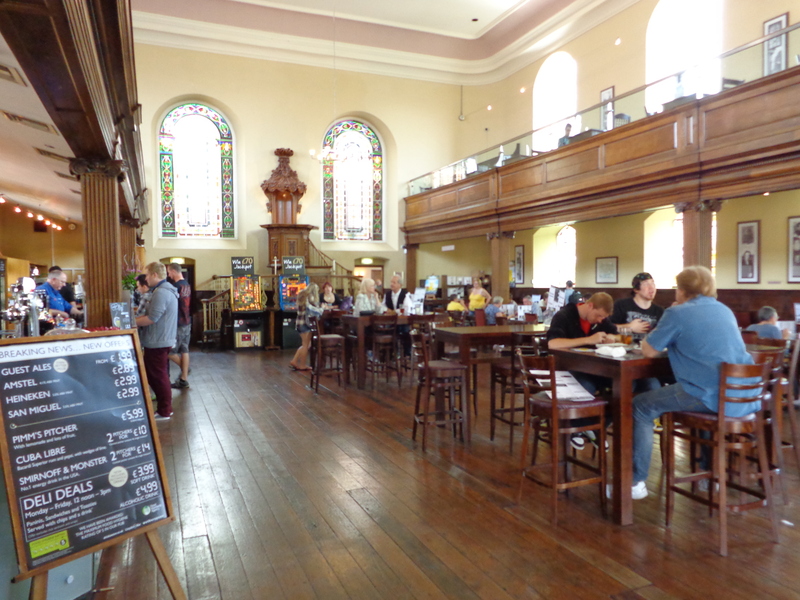 In Exeter it has two pubs in historic repurposed buildings: George’s Meeting House with its cavernous, airy interior, splendid stained glass, twin galleries and pews, is a particular delight (even with the gaming machines that now obscure the magnificent pulpit). Meanwhile the ‘Imperial’ has gone through many transformations recently: originally a nineteenth-century grand private dwelling, it became a hotel in the 1920s before being bought by the chain in the 1980s. 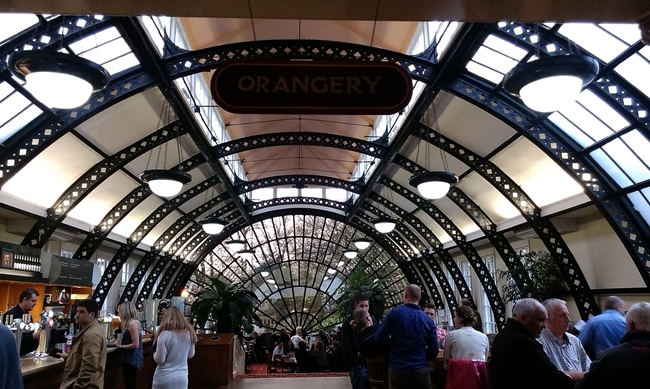 None of this has reduced the visual impact of the magnificent orangery. And ultimately I am left wondering – what is the purpose of preserving something for as long as humanly possible, to the exclusion of everything else? Surely the stuff of the past is only useful if we actually benefit from it? Intrinsically it is all just bits of stone, wood and paper, lumpish and meaningless until a human actively engages with and imparts meaning to it. Isn’t it preferable that millions of people get to see Pompeii before the inevitable happens and it dissolves back into the dust, rather than pointlessly extending its life whilst nobody is allowed near it? Thus perhaps sensitive compromise is the order of the day. To return to the Sir John Soane’s Museum, given the chance, there were things that I would have liked to discuss further with my volunteer. Currently the museum does limit the number of people allowed into the museum at any one time, but other measures might alleviate overcrowding. Could a one-way system be introduced to allow visitors to navigate the house? Maybe this could be co-ordinated with the times of guided (paid) tours to prevent blockages in the narrow walkways. For smaller heritage sites (often those most in need of cash) perhaps we should reconsider the principle that all museums are free – currently collections that are funded directly by the central government are all free to view. Yet charging admittance to some places could raise revenue and redirect the more casual tourist away to larger, better equipped, free attractions. My first post provoked lots of response from archivists and historians on twitter and this issue was raised by several people. Probably better than paid entrance is Manya Zuba’s suggestion that free viewings should be by appointment, with slots available throughout the day (short term exhibitions at various museums and galleries, including the British Museum, already use a booking system like this). As Sjoerd Levelt pointed out, this would add a threshold, ‘but one that can be ameliorated by some proper thinking about well-aimed inclusive policies’. Access would therefore be open to all, if they were sufficiently interested to plan ahead and spend the time making an appointment. Finally, Soane’s museum also currently houses the original series of paintings for William Hogarth’s ‘A Rake’s Progress’, although you can only view them briefly if the attendant is on hand to open up panels to reveal them. My guess would be that the paintings are important in drawing visitors to the museum – perhaps they might be better placed somewhere where greater numbers of people could see them to better advantage. Maybe more, and more friendly information should be given to visitors to explain the current arrangements and to encourage visitors to be especially careful when navigating around the museum. Detail from painting four of The Rake’s Progress – ‘A Rake Arrested, going to court’. 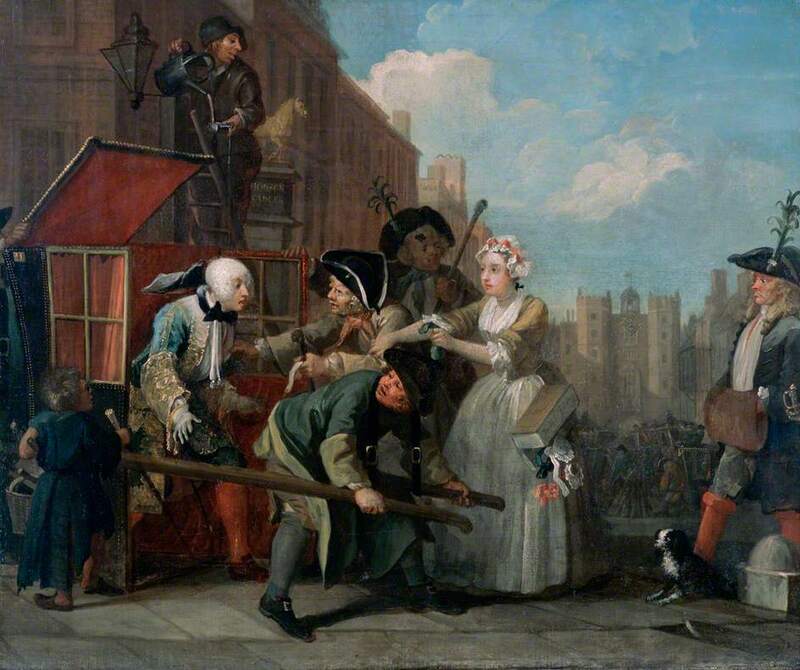 The incredible detail in William Hogarth’s paintings richly rewards sustained examination, but there is little opportunity for this currently. But these are just the musings of an amateur who knows very little about this complex issue. There aren’t any simple answers as to how we should conserve our national heritage, and at every stage the interests of different groups must be carefully balanced and weighed. 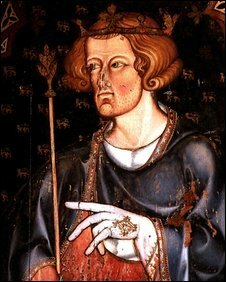 And of course I wouldn’t really steal a finger out of a grave, however long-dead and important it’s owner was. Mr G was observed to put his Hand into the Coffin and immediately apply it to his Pocket: but not so dexterously that the Dean of Westminster saw it: he remonstrated against the Proprietary of it, and Mr G denying the Fact, the Dean insisted on the Pocket being searched: when they found that he had taken a Finger; which was replaced. Who wouldn’t want to nab one of those lovely digits for posterity? In Gough’s defence, I should add the proviso that Cole was not sure whether to believe the story or not. But let’s assume the story is true and that Gough had attempted to make off with a macabre souvenir of this momentous occasion. At first it seems shocking that a well-respected antiquarian, someone dedicated to uncovering and preserving the nation’s past, might act in such a selfish and self-centred way. But the more you think about it, the less surprising it is. Put yourself in Gough’s shoes – wouldn’t you be tempted to take a piece of the nation’s glorious history for your own? Or would your sense of ‘proprietary’ and your respect for the dead stay your hand? What harm would it do to lift one of those smaller bones, wouldn’t there still be plenty left? You would look after it and treasure that little finger, and get great pleasure from possessing it, wouldn’t you? Beyond this particular dilemma the reality is that conserving the documents and objects of the past is a cultural, technical, economic, intellectual and moral minefield. Wherever you turn conservation is fraught with ideals in tension and competing interests, and each contributor to the argument has perfectly reasonable logic to support their point of view. Tricky questions abound: who owns the relics of the past, and who should be given access to them? How to you balance preservation with exhibition? What’s the point of conserving anything, and how do you decide which bits should be kept? Preservation or restoration? Open access or aggressive protectionism? We have all heard stories of archivists who are so intent on protecting their collection that they become more a hindrance than a help in attempting to access the stuff of the past. Yet at the same time we can sympathise with the impulse to protect and extend the life of the fragile documents that are so crucial to being able to understand our history – it’s just that, if no one gets to see them, how can those histories be written? It’s not only paper that needs to be protected either. For many years now, worrying stories about the disintegration of the ancient Roman city of Pompeii, a UNESCO world heritage site, have littered the news, with the site becoming a symbol for what some see as decades of mismanagement of Italy’s cultural sites. Pompeii is fundamental to our understanding of everyday life in ancient Rome, and it receives about 2.5 million visitors each year. It isn’t hard to make a case for its international significance and value, but it does seem that it is very hard to effectively conserve it. For me, it was a recent visit to Sir John Soane’s museum in London’s Lincoln’s Inn Fields that brought the issues into sharp focus. 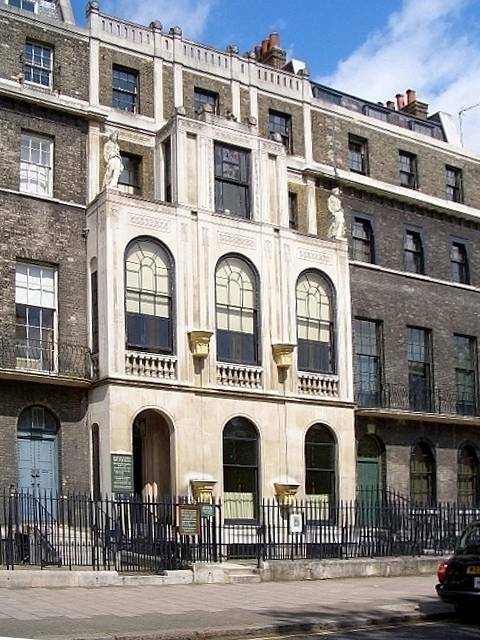 It’s a fascinating place – Soane was a Professor of Architecture at the Royal Academy and a great collector, with a houseful of books, casts and models. In 1833 he negotiated an Act of Parliament to settle and preserve the house and collection for the benefit of ‘amateurs and students’ in architecture, painting and sculpture, on the condition that the interiors be kept as they were at the time of his death. In the nineteenth century some alterations were made to the house however, and a five-year restoration programme to restore the museum is just reaching its final stages. 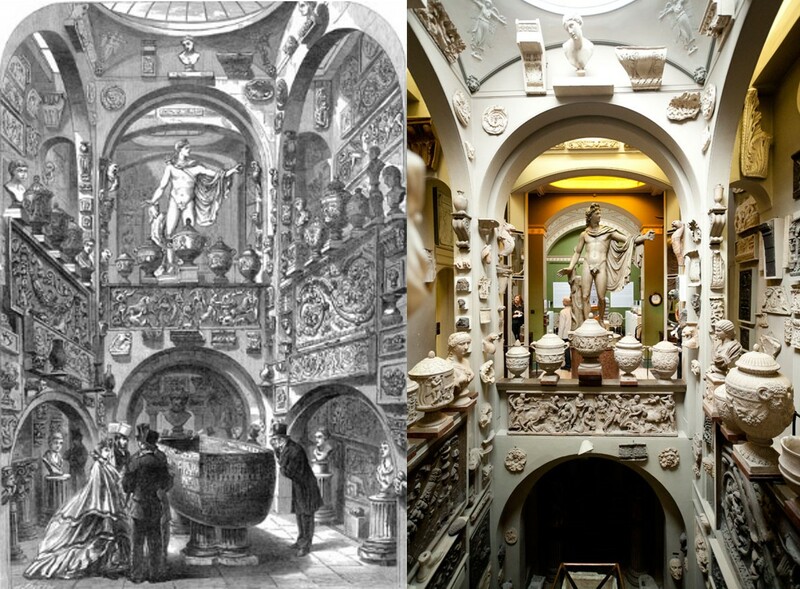 Sir John Soane’s Museum, interior in 1864 and 2014. Today this little museum is enormously popular. It is on the tourist trail and appears on the Lonely Planet’s list of best museums and galleries in London. Indeed, it is a wonderful place, and was of particular interest to me, given that my current research is on Ralph Thoresby, another chap whose house also doubled up as a museum. However, Soane’s museum was very busy and overcrowded, and it wasn’t easy to negotiate around the narrow walkways and tight corners whilst also keeping well away from the innumerable artefacts that clogged every available surface. Whilst waiting to go into one room, we had an illuminating discussion with the volunteer who was guarding the door. Having started with a pleasantry that it was rather busy, the volunteer curtly told us that the popularity of the museum was a disaster. We wondered why that was – surely high visitor numbers helped to secure the museums future? Not so – it is free to enter the museum, so large numbers of visitors bought more trouble and damage than they were worth. The volunteer went on to state that it was ridiculous that the site had become a tourist attraction, and that he believed the museum should be returned to its original function – as a library and resource for architectural students only. This brief exchange left me with lots of questions. Instinctively, as a professional historian, I felt that I was a more worthy visitor that the gaggling mass of rather uncomprehending tourists who zoomed round the museum before consulting their guidebooks to check out the next stop on the museum trail. But according to the volunteer, I had as little right to view the museum as them, and admittedly it is true that seeing the museum was hardly vital to my research. I do pay taxes in the UK though, and given that a large part of the museum’s funding comes from the Department for Culture, Media and Sport, surely I was a stakeholder in the museum? And what about the trustees’ responsibility to ensure that the collection is accessible to the general public? Soane’s museum is therefore an excellent window into the heritage problem, which I will be exploring further in my second post on this topic next week.